Keretapi Tanah Melayu Berhad (KTMB) or Malayan Railways Limited is the main rail operator in Peninsular Malaysia. The railway system dates back to the British colonial era, when it was first built to transport tin. The mainly single-track railway network with a total length of 1699 kilometres consists of two main lines, the West Coast Line and the East Coast Line and several branch lines. KTM Intercity (Malay: KTM Antarabandar) is an intercity passenger railway service operated by Keretapi Tanah Melayu within the regions of Peninsular Malaysia and Singapore. The service is intended to carry patrons between stops serving cities, town and village (depending on regions), its trains currently powered by diesel locomotives. 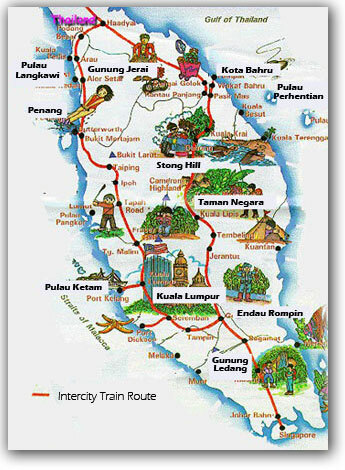 KTM Intercity services consist of local trains (known also as "mail trains") and express trains; lines along the West Coast of Peninsular Malaysia currently support mostly express trains, while those along the East Coast include both mail train and express train services. Ever wonder about life in a traditional Malay village, where you get to wake up to the sounds of the rooster or simply sit idyll by the river to fish? Or catch a glimpse of sturdy fishermen, up early by the break of dawn as they prepare to go to sea during the fishing season; eat the specialty nasi kerabu a coloured rice dish served with herbs, chillies, flaked fish and spices; or watch a gorgeous sunset by the paddy fields. Then, you should go on the Kelantan Homestay Programme. There are about 161 homes from 8 different kampungs that have registered under the programme. All that meals and activities during the programme are simply Malaysian. There are many activities that you can partake during the programme, from cooking traditional food in a traditional house, experiencing rubber tapping, going to the fruit orchard, feeding the life stocks and many other village people activities. A unique opportunity where visitors’ can see and experience up close a simple Malay village lifestyle in the state of Kelantan, located in the north-east of Peninsular Malaysia. Kelantan known as the cradle of Malay culture, has a significant high percentage of Malay population in the state. Though Kelantan has had its share of influences from neighbouring country, Thailand, it still retains a much part of its identity, unique Malay language, arts and crafts, cuisine, and pastimes. This community-based homestay programme takes you right into the homes and lives of Kelantanese villagers, providing you with an unique opportunity to interact and learn more of their rich, local culture. Get to experience first hand the daily life as a farmer, fisherman, batik maker, housewife, in the local village. Be involved in the many activities awaiting you at the homestay village; seasonal fruit picking, rubber tapping, cooking traditional food, playing musical instruments, watch a cultural performance, learn a traditional dance or song or even, be smitten by a mock wedding celebration. The facilities and activities offered in the homestay programme varies from host to host, but whichever place you stay in, warm up with the friendly villagers as they treat you as one of their family members. The villages taking part in the homestay programme have also gone through very strict guidelines from the Ministry of Tourism, to ensure that visitors’ enjoy the best of Malaysian hospitality. Homestay is a programme where you can live together with the host family that they have already choose in a different village that taken part in the programme. There are many villages that are available in this programme including in Kelantan. You can experience a unique and different village environment since the first day they came to the village. By joining a simple Malay people in a simple but yet beautiful village, they will be experiencing something that they cannot even imagine. The differences came in many forms either through the villages environment, scenery, cuisine, cultural heritage, outdoor pursuits, handicrafts and the most important is the people in the village. As every people was very committed to make this programme as your most valuable experiences, the village was given a strict guidelines from the Ministry of Tourism. Pictures of homestays are courtesy of Tourism Malaysia. Pictures of KTM train are courtesy of KTMB.